"It's not supposed to do that…"
MyHDL: First LED Blinker Test Working! 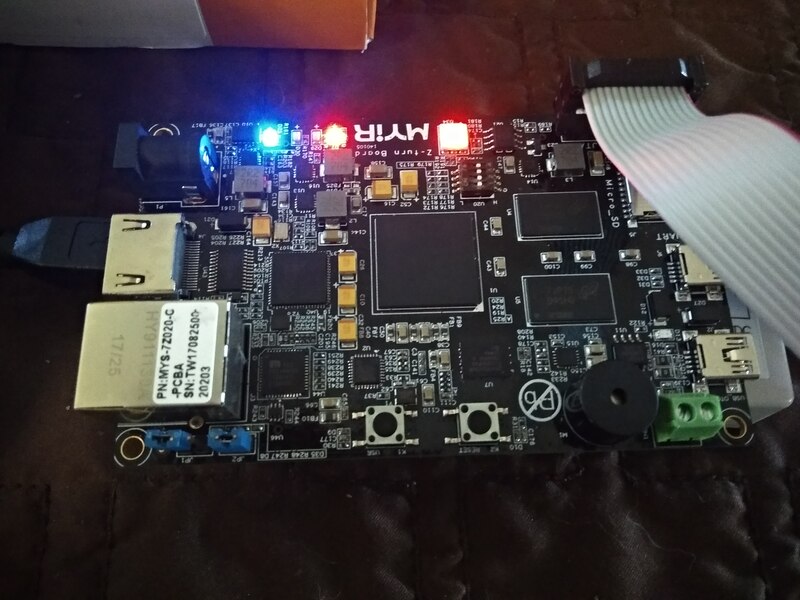 I’ve been tinkering with MyHDL lately on the Z-turn board by MYIR. I have to say this board is pretty fun to play with so far, and i’ve left some resources on my blog about it, that might get updated later: MYIR Z-turn FPGA Board Pin Assignments. Back to the MyHDL. I’m only just starting Python, but from the looks of it, it’s been fairly painless to understand so far. The use of Python (MyHDL is in fact only a library that’s used to do hardware dev and simulation) makes it faaaar easier to simulate designs than using the very frustrating Verilog simulators out there. With the RTL logic, the rest of the verification framework can be regular python. Run the project, and you get a neat GTKWave output file, load it in, check if everything is okay, iterate. I’ve written a little LED blinker for the Z-turn. It’s not the most amazing project ever, but it’s good as a template perhaps. ## Not synthesizable, it is used for the bench. reset_n: input, reset signal, inverted. # Rig up for synthesis. Running project looks like a board with a blinking LED. To get rid of this annoying delay, for example when running a sudo command, you can do the following with PAM configuration. Additionally, for regular “su”, you’ll want to go to the configuration file /etc/login.defs and set the appropriate option. ExpressVPN comes as either a deb or rpm package. We’ll choose the rpm package, so first install that. Then you want to install the package without any dependencies. ExpressVPN is now installed, but since Gentoo runs the OpenRC init system we’ll want to go ahead and create a service file in /etc/init.d/expressvpnd. We need some more configuring. Then you can start the service as usual and add it to your runlevel default, and control the application using the Firefox extension available on the main website. Looking at Crypto coins block explorers, I was wondering in the case of altcoins if the Merkle Root field is still computed the same way as in Bitcoin. There’s already a lot of information on the general theory behind a Merkle Tree, so please refer to external sources for a better introduction. Here is instead a small worked example of how this applies to Bitcoin and as we will see, also Vertcoin. This simple function computes the SHA256d hash of a byte array, as used everywhere in Bitcoin. For the simple case where Tx count = 1, the Merkle root is simply the hash of the first transaction. For a block with more transactions, let’s illustrate. However there’s a bug with taking these values directly. It turns out Satoshi decided to flip the hash values for whatever arbitrary reason. We’ll need to unflip them to the correct endianness for our trees to grow correctly. Then from theory we know that in our case, Root = Hash ( A | B). Compute this, flip the bytes again, and you get the correct Merkle root as displayed in the explorer. For blocks with more transactions, repeat this process by merging more pairs. The same process is used for both Bitcoin and Vertcoin, as well as probably a lot of other alts. Displayed hash values are byte-flipped around. Since WordPress is not very good at displaying inline C++, here is the complete code example. Instead of looping around, there’s a simpler way. The code in question is found in the excellent hobby OS sortix. Unfortunately, when you try running certain games on a mac, on a case sensistive HFS+ filesystem, you might hit a roadblock. Steam itself will run fine. Fortunately there is a solution by using OpenZFS. I won’t go into the details of installing ZFS on a mac as there is plenty of information out there. I simply use homebrew for that kind of thing. Refer to the OpenZFS Wiki, they have instructions on how to install using homebrew. OpenZFS supports creating a pool inside a file, so this is what we are going to do. Then you will get a shiny new volume with the required properties under /Volumes/steam_pool/. Fire up Steam, tell it to install there. Enjoy, and don’t forget to read up on ZFS basics if you don’t know how to export and import a pool.